I began writing this post with people who just began a new workout program in mind. I wanted to help them understand why gaining a pound or two, or staying the same weight after only being a week into a workout program is NOT something to be overly concerned about. If you’re not new, feel free to jump down to the subsections that are pertinent to you. As for the beginner, the first week of a new workout program is a very exciting time. If your goal is to lose weight, I’m sure you’ve already anxiously weighed yourself and are ready for the weight to come flying off. But then…something must have gone horribly wrong, because as you step on the scale the next time, you’re having trouble believing that after all the hard work and effort you’ve put in with diet and exercise that nothing amazing has happened. I gained a pound this week! What am I doing wrong? My weight stayed the same this week! This is not working. What you should do at this point in time… RELAX!!! You did not gain three pounds of fat overnight – it is impossible, and you did not lose three pounds of fat overnight either. 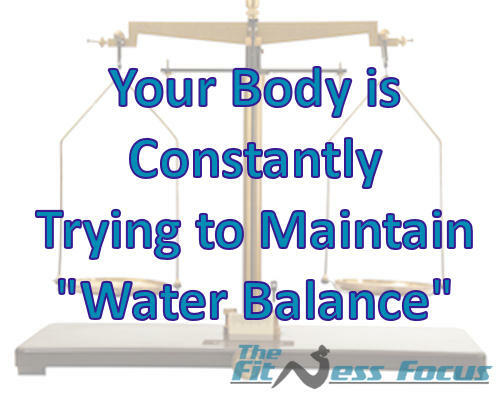 Let us first take a step back and always remember this when weighing ourselves: Body Weight Fluctuations of 1-5 Pounds a Day are Perfectly Normal. 1. Sodium: Think of your body like a pendulum scale. If you eat more salt than usual one day, your body will react by trying to balance the scale by retaining more water. Eat less salt than usual, and you have the opposite affect. 2. Alcohol: This diuretic causes dehydration in the body, which leads to water retention. The water retention is a result of your body wanting to make up for the difference in water levels drinking alcohol has caused. 3. Carbohydrate Intake: This is another complicated process in the body that I will try to explain simply. The body turns the majority of eaten carbs into glucose for immediate energy, storing them in the liver. Glucose that is not used for immediate energy, turns to glycogen. Glycogen is stored in the muscle tissue, which can lead to water retention. Switching to a low-carb diet often leads to rapid weight loss, but it is not fat you’re losing, it’s the body using up the stored glycogen for energy, which causes less water to be retained – thus leading to weight loss. 4. Strength Training: Lifting weights or doing body weight exercises causes trauma to muscle tissue. This is how the muscle rebuilds itself and makes you stronger and more toned. But in order to rebuild the muscle fibers, your muscles retain water to help speed up the process in the cells. 5. Restroom Usage: 1-3 pounds a day of body weight change can be seen by using or not using the restroom. I’m not going to go into detail here, because I think this one is pretty self-explanatory. 6. That Time of Month: Most women are probably familiar with this one already, but I figured I would reiterate, so there are never any worries. Experts believe that water is retained when hormones fluctuate, especially about one week prior to your monthly visitor. I can vouch for this one, gaining over 5lbs of water weight when it’s that time of the month, which makes me feel a little sad for weigh-in day, but at least I know why – and the next week is always in a positive direction. 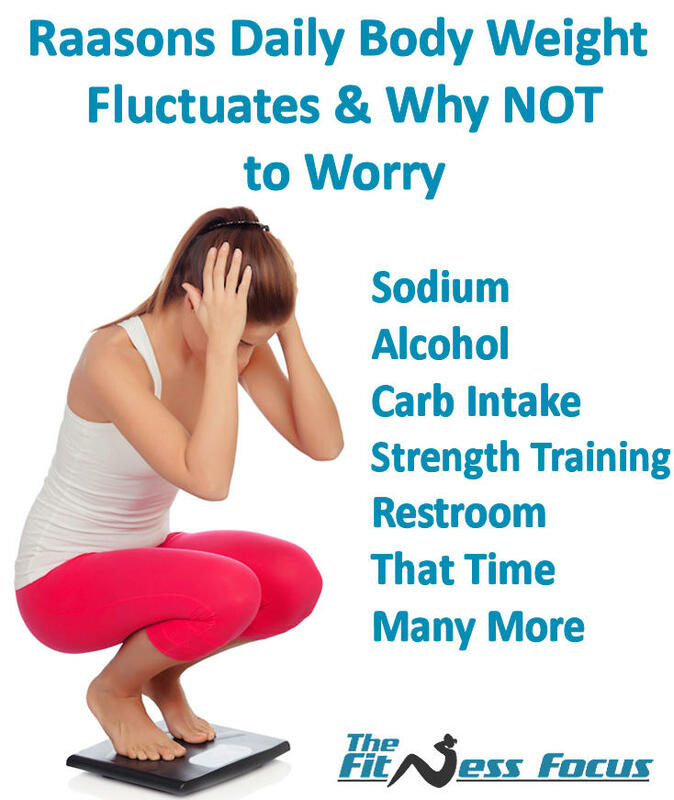 All of these can make your body weight go up or down without causing an increase or decrease in body fat. They are not necessarily areas you need to overly concern yourself with controlling, but hopefully now that you know a little more into how and why the number on the scale is not stable, you will relax a little when you step on the scale and it’s not necessarily what you were expecting. Point to remember: weight loss or decrease does not necessarily mean fat loss or gain. What is Sustainable Weight(Fat) Loss? 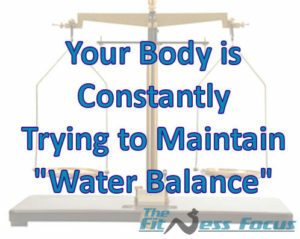 The human body is always trying to maintain water balance for our overall health. One to two pounds of weight loss is considered to be a healthy amount of weight to lose in a week. Why is more weight not better? If you lose more than the 1-2 pounds in a week, it most likely not just body fat. It could also be muscle tissue, water weight, etc.. You never want to lose muscle tissue, because muscle is metabolically active. That just means it burns calories even when you are resting. There are variances in how much a person will lose that also depend on a variety of factors. Men or woman who have a lot of weight to lose can often see the numbers on the scale drop much more quickly than someone who is nearing their goal weight. And men, thanks to naturally having more testosterone than woman, build muscle more easily, which can lead to more calorie burn and faster weight loss. This also allows them to eat more calories. How Much Do I Need to Cut My Calories? As an estimate, you need to create a calorie deficit of 3,500 calories each week to lose one pound of body fat each week. A goal of creating a daily calorie deficit of 300-500 calories a day is said to be optimal for long-term sustainable weight loss through diet and exercise. Picture this: A pound of fat tissue takes up roughly the size of a grapefruit. The same pound of muscle tissue takes up roughly the size of a tangerine. Now imagine replacing 10 grape fruits with 12 tangerines spaced out around your body. This simple illustration is why so many people say their weight stays the same or even slightly heavier, but their clothes are fitting better and more loosely. I see and hear this a lot when people begin a new workout program that contains resistance training,. I realize that adding a half pound of muscle does not sound like a lot to most people, but do this for four weeks in a row, and you will gain two pounds of lean muscle mass. Now that is seriously nice work! However if you had only concentrated on the scale number, it could be a little disappointing. Weigh yourself under the same circumstances, same clothes. I personally weigh myself in my undergarments. Weigh in at the same time of day – preferably in the morning after using the restroom. Choose the same day of the week to weigh yourself – preferably Wednesday if you tend to treat yourself on weekends. Men weigh in once a week. Women try to weigh yourselves once a month, but at tops, once a week if you can’t resist. Keep track of that monthly number, too! Also try using pictures to track your progress. I know no one likes looking at themselves when they’re not in the shape they want to be, but take pictures, so you’re not totally relying on the scale. Sometimes what the number reports back is discouraging, but when you see the changes from an outside perspective, it is enough to keep you going. That is what I did when I first lost all the weight, and quite honestly, the photos were my incentive to keep going and keep pushing hard and eating right each and every day. As hard as it might be, try not to worry about the display on your bathroom scale when measuring results. Instead, focus on how much better you are feeling and how much better your clothes are fitting. Those are the changes that really matter. I have completely swapped my meal routine, which has worked very well for me. I eat a fairly light breakfast now, either two slices of toast & jam, or a bowl of cereal. I have my main meal at lunchtime, which will be quite large, but always crammed full of vegetables, a meat or fish main item, and usually a creamy homemade sauce with rice or pasta (sometimes mashed potato or chips). In the evening I have a small tropical fruit salad with a fruit flavoured yogurt poured over the top. I’m sustaining 1-2lbs weight loss per week and have dropped from 15.5 stone to just over 12 stone. I should also mention that I’m a 6′ 6″ ultra long-distance runner, and I repeatedly suffered from injuries due to my weight. I benefit from being able to eat more because of the amount of exercise I do, but I am also a living example of the fact that you can’t outrun a bad diet (I run approximately 60 miles per week). My target weight, to sustain, is to break below the 12st mark. I have a major event at the end of October (The Indian Summer Ultra in the Netherlands), which seems to me to be the ideal goal. I agree with all of your guide, Bethany, and I learned a thing or two as well, so thank you… but I would add that changing when you have your largest meal (without even changing what you eat), makes a big difference, and it is probably the main contributory factor to my continued weight loss. I think it’s more useful to weigh yourself daily and take the average for the week. Compare that to the average for the last week. It smooths everything out. Wow, this was so helpful. It answered every question I had. Thanks!!! i”m down 23 pounds after 5 weeks and wanted to weigh myself today. Now I can wait until my normal day which is Friday. You’re welcome! Glad you enjoyed and congrats! The most important thing is to buy into the process. The results will come, but you have to realize this is a long term commitment (as in the rest of your life). After the weight is off you need to keep the good habits of exercise and sensible eating going. It’s really helpful. Simple and understandable. The volume of fat vs muscle is commonly incorrect. 1 lb of muscle is .43 liters in volume. 1 lb of fat is .51 liters…about 18% greater volume. So a “tangerine” sized amount of muscle would equate to about 1.18 tangerines of fat…definitely not a grapefruit, which would be more like 2 or three times the size. People do seem to get hung up on this comparison, which gets them thinking that replacing fat with muscle, pound for pound, will be a dramatic decrease in size. In fact, about 17 percent less size IF every pound of fat was replaced with a pound of muscle–which of course is not realistic. A better way to look at it is to understand that a pound of fat is about .51 liters in volume, which is the volume of a 16.9 oz bottle of water or soft drinks, like a plastic bottle of diet coke. Now, imagine losing 30 lbs—that is 30 soft-drink-sized bottles of fat coming of your body…a LOT!!! Then at the same time, gain 3 lbs of muscle…the net loss is now down to 27 soft drink bottles in volume…still a LOT! The bottom line…lose that fat and you’ll lose a LOT of volume! Actually I was even incorrect just now! Losing 30 lbs of fat would equate to 30 soft drink bottles; but adding 3 lbs of muscle would actually be about 2.5 soft drink bottles, for a net loss of 27.5 bottles of overall size, not 27 as in my previous comment. Just a minor correction! I was wondering about weight fluctuation and you explained it so well in this article. Thank you! Hi Bethany, do you have any sources/ studies that you relay on? The main question I need to be scientifically answered is: How long does a training intervention needs to be, to show results on the suspect? I am in a different category where I’m trying to put on weight, but can’t. I’m 5’10”, and 130 right now. Everything I read is about losing weight, not gaining. I weigh myself in the morning, and sometimes periodically thru the day as well. I’m getting concerned because even though I eat, my weight doesn’t go up. Sometimes it goes down! Like today I weighed myself in the morning at 132.8. Had a bowl of oatmeal for breakfast, and a big sandwich for lunch. Weighed again after that, and it was 132.4. At a good dinner, some chips to snack on at night and weighed again before bed. 131.6. How is this possible? Is this something to be concerned about? Please help, thank you. I ate some air popped popcorn last night but used a lot of salt. I weighed myself yesterday, first thing in the morning, after using the restroom and weighed 123.8 lbs. (digital scale). I just weighed myself now under the same circumstances as yesterday and I weigh 127.0 lbs. I am freaking out, but will try to weigh myself again tomorrow after not eating that popcorn with so much salt. I have been weighing in on Mondays and I typically eat more sodium during the weekend so I think I will change it to the middle of the week. Thanks for the article.